All the functional benefits SuperPlusRadio promises, may get quickly overshadowed by the threats the application may expose you to. Though the adware is presented as a radio playlist application for your Internet browser, it is actually a new variation of the adware program Radio Crayon. To protect your computer, take the necessary precautions, delete SuperPlusRadio, and find a more reliable radio app. SuperPlusRadio v2.1 is published by ColoColo Apps; the team known for developing software that can be classified as adware. SuperPlusRadio is developed using the Crossrider framework that allows developers to create various extensions compatible with the main Internet browsers Internet Explorer, Firefox Mozilla, Google Chrome. 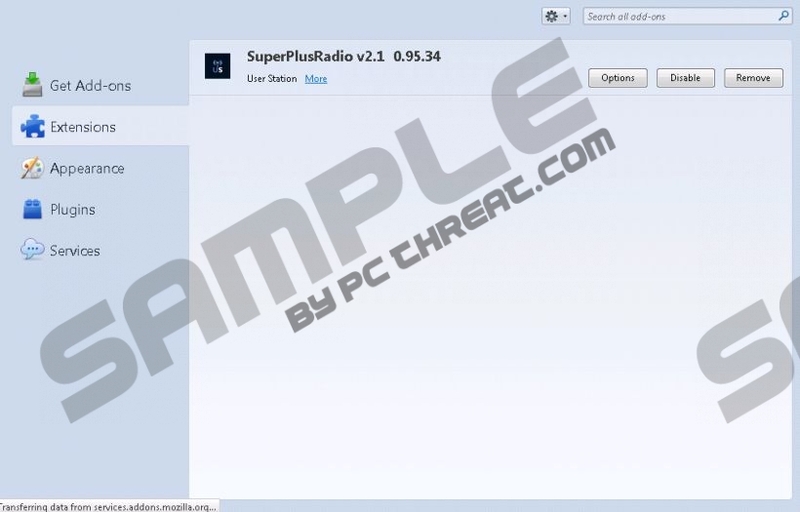 SuperPlusRadio may reach you bundled with freeware installers. You cannot download it from its official site, thus refrain from downloading any software you find on the third-party sites. Regardless, if you are willing to go through with the installation of such software, at least be attentive not to install any additional applications of unknown function or origin. However, remember that even if you have already accidentally installed SuperPlusRadio on your computer, you might still have time to remove the adware before it has started cramming commercial material to your Internet browser. When on your computer, SuperPlusRadio gets access to your browser via Dynamic-Link Library (DLL), and then starts monitoring and controlling your browser’s activities. You might find this surveillance alarming as it is never clear where the information about your Internet preferences is sent to, therefore in order to protect your private data delete SuperPlusRadio immediately. The information is collected in order to trigger specific advertisements in the form of pop-ups, banners or coupons that are meant to redirect you to third-party sites. It is hard to know what kind of risks your computer may get exposed to in the said web pages; hence, it is advised to avoid clicking any of the promoted sites and remove SuperPlusRadio program to secure your computer contents. Do not forget that SuperPlusRadio could be misused by malevolent third parties to distribute their content, and that is something you should not risk at any cost. In short, if you do not want to put your computer system at risk, remove SuperPlusRadio immediately. Follow the guidelines below to terminate the program completely. Also, do not forget to rid of the adware both from Control Panel AND your Internet browser. Then install a reliable computer security tool and carry out a complete system scan to make sure there are no active threats on the PC at the moment. The security software will also work as a safety net from all the other dangers you may face on the net. Quick & tested solution for SuperPlusRadio removal.